PLUSCO 601 Film Forming Lubricant is a highly concentrated film forming lubricant formulated to decrease lubrication internals and increase equipment productivity. PLUSCO 601 Plus Lube is made with PLUSLON® which is inert to acids, caustics additives, various hydrocarbons including gasoline and solvent. PLUSCO 601 Film Forming Lubricant film forming properties exhibits an extremely low co-efficient of friction through its film forming action thus separating surface-to-surface contact and thereby conserving energy. The residual film of PLUSLON® provides instant lubrication to the critical areas of the equipment which require instant lubrication during start up. This film forming lubricant reduces equipment wear and guards against the effects of corrosion and damage from rust to vital equipment areas. 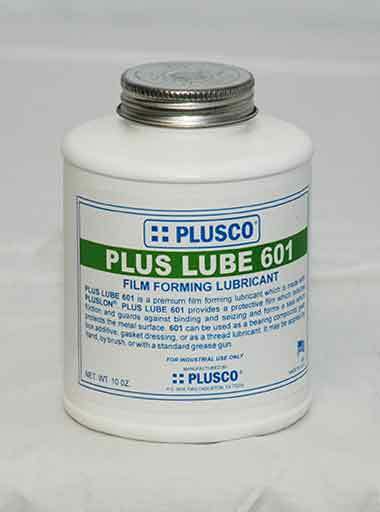 PLUSCO 601 Film Forming Lubricant is an extremely versatile lubricant with a broad range of applications. PLUSCO 601 Plus Lube is effective for certain bearing applications operating on low torque and under extreme pressure conditions. PLUSCO 601 Plus Lube can be used as an additive to gear reduction units, manual transmissions, chain drive units, conveyor systems, to bolts and studs and can be used as a gasket dressing.